The first Canyon views bring a gasp of amazement. Can this be real? Is is some kind of lighting trick? Reality set in, and my head swiveled from side to side to take in the extraordinaryness that is Bryce Canyon. My second thought? I don’t have the camera or skills to capture this. I wish I had a stereo, or 3D camera. 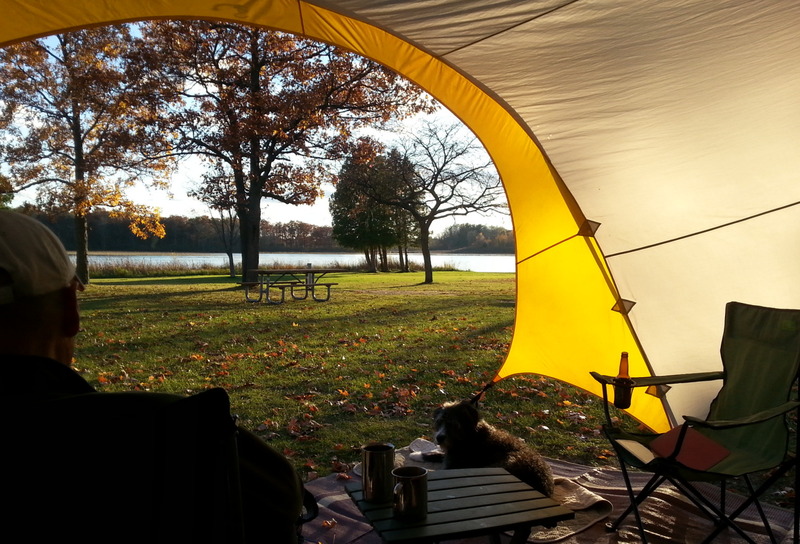 Our three-night stay in the North Campground turned into four, as we swiftly figured out that we couldn’t possibly drink in all the sights in such a short time. I don’t know how much time would be enough, but we didn’t reach that limit. At Bryce, the attraction is the hoodos, those tall skinny spires of rock that reach up from the Canyon bottom and are wind and weather eroded into spectacular formations. Some have names, such as Tower Bridge. Others set your imagination reeling with images from your own knowledge. Some days, we shuttled to trailheads on the amazing bus system, and bicycled back and forth other days when it suited us. It was always cold in the morning, warming up into the mid 60’s – 70’s during the day. Spectacular winds blow through the Canyon, swirling dust devils through the air. Parents clutched their kids, and everyone hung on to their hats. John convinced me to step out to precipice for a photo op. I had to brace myself from being blown off the edge, and hang on to my favorite hat at the same time. We hiked the northernmost trail (Fairyland Canyon) and the southernmost trail (Bristlecone), and several inbetween those two. 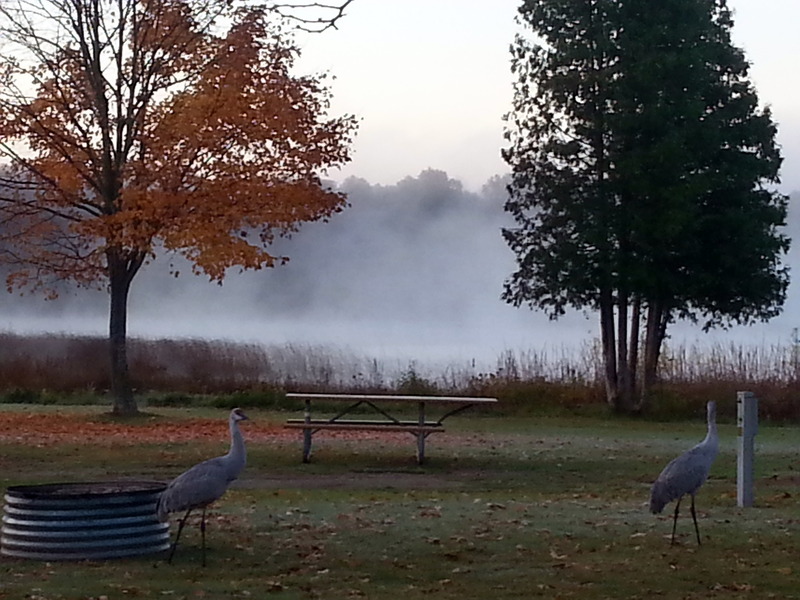 The details of each day have already blurred, so I’ll just share a few of my favorite photos. Even if you never hike, amazing views can be had from the Rim Trail which travels along the 18 mile length of the Canyon. Take the shuttle, jump off and on and you please. Even the jet contrails above Bryce resemble hoodoos. I was sorely tempted to turn this photo upside down to make my point, but you’ll get it anyway. My quest for the Bristlecone Pine, the oldest living trees on earth was answered, but not in the manner that I had hoped. This is what I had hoped to see, but the Bristlecones we saw were far less spectacular. But we did observe many in varying stages of life, and felt privileged to do so. We saw some variety of spruce that was forming cones, and the branch tips were bright pink. Perhaps it was new branch growth, but it appeared to me to be cone formation with the striking color. A visit like this will remind you of all you do not know, and probably will never really understand. Now we have seen the oldest (Bristlecone), tallest (Coastal Redwood), and largest (Giant Sequoia) trees in the world. My heart still belongs to the Sequoias, but it quiets me to be in the presence of any of these giant trees. Tomorrow, we plan to venture back up into Grand Staircase to see if it’s possible to actually stay and explore for a night or two. But, having had one bad towing experience, we’re not about to expose ourselves (willingly) to another. We may roll eastward. Destination unknown. After traveling around and camping in the US for the past four months, John and I decided to add a bit of international flavor to our trip. So, we jumped on our bikes (from our current base in Carson City, NV) and headed off to the Sovereign Republic of Molossia, a scant twenty miles away. Never heard of Molossia? I’m shocked! 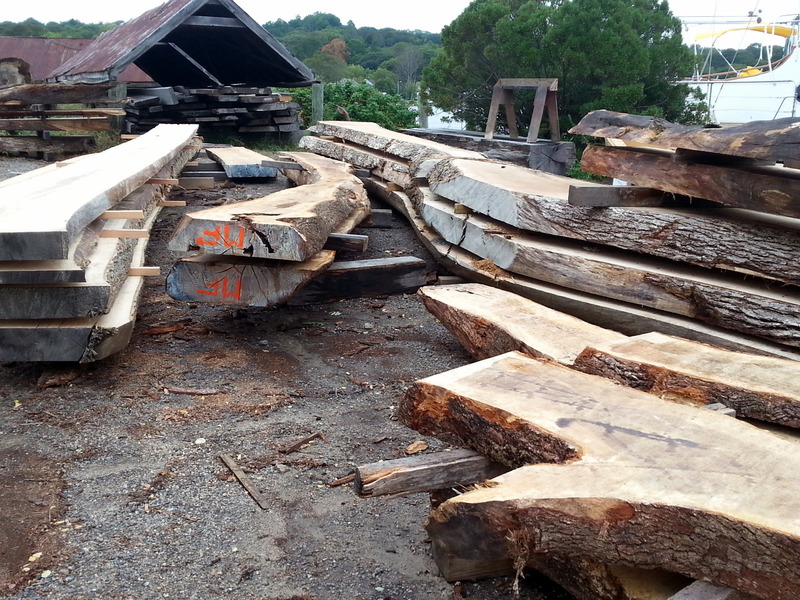 It all started with an article from Atlas Obscura, which I read just a day or two ago. (I urge you to read this, so you will understand why we needed to make the long trek to a foreign country). It seemed only reasonable to bike up there to see what Molassia is all about. The article linked above indicated that tours would be given on April 16, which just happens to be Obscura Day (whatever that is). We even brought our passports, in hopes of getting the coveted Molossia stamp, which was also referenced in the article. Well, the welcome mat certainly was not rolled out as we had expected. No Trespassing signs were everywhere. We were warned not to cross the clearly marked US/Molossia Border, without permission, which we didn’t have. Inside the Palace or Official Residence, we could hear somebody vacuuming (presumably the President, First Lady, or one of the 31 other citizens of Molossia). 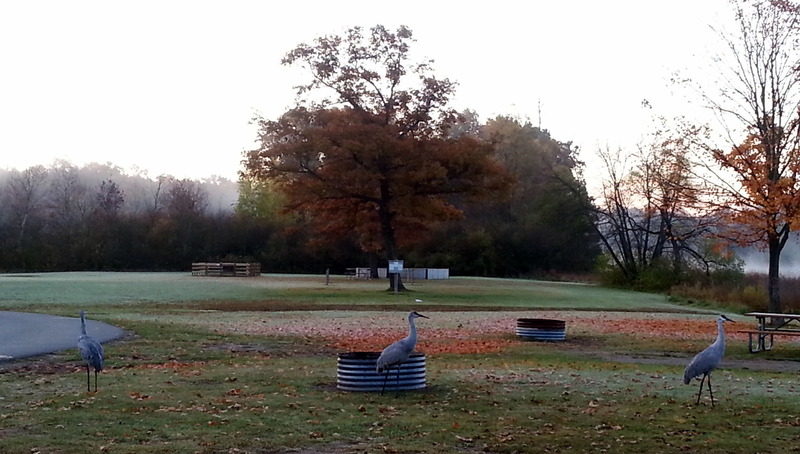 We were hesitant to approach. From a distance, we could see the business center of Molossia, which seemed to consist of a Post Office, bank, some kind of t-shirt shop, and a few other sites which were too far away for us to clearly see them. Fred, the guy at the Border Control station was distinctly unhelpful. After propping our bikes up for a few photos, we sadly pedaled away. Perhaps if President Kevin Baugh would send the Official State Limo to pick us up, we would consider another visit. Until then – Bah! 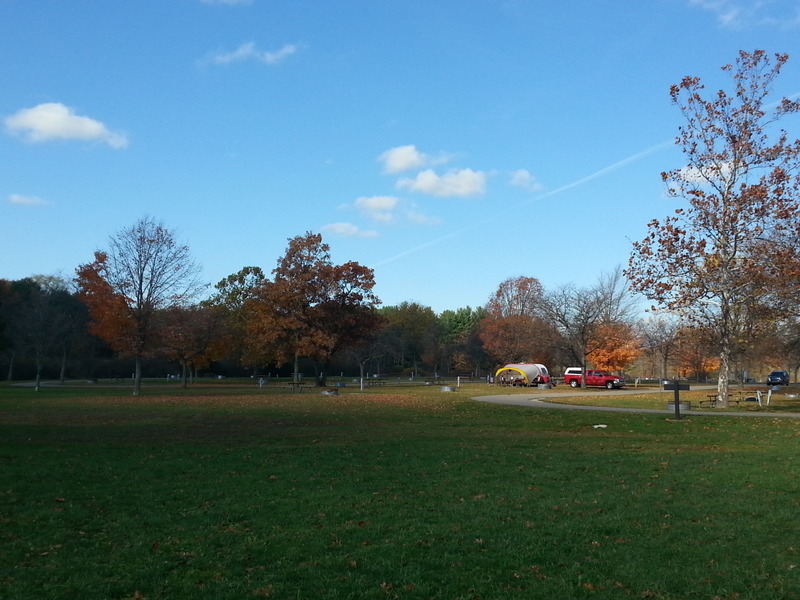 On the bright side, we pedaled about 40 miles – checked out Dayton State Park, had a superb (and cheap!) 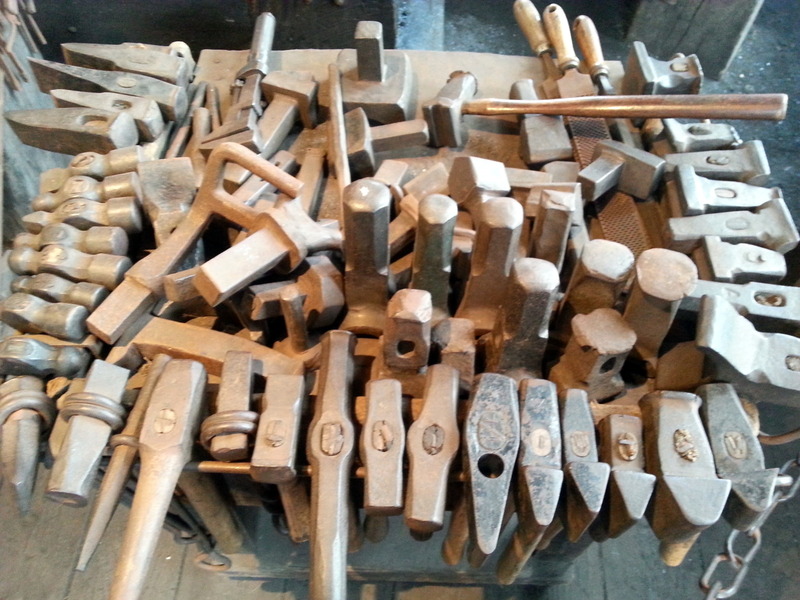 lunch at Compadres in Dayton, and sneaked a peek at some of the treasures stowed away at the Dayton Historical Museum. Here are a few other shots of our day’s adventure around the Dayton/Molossia area. It was a pretty good day. What a difference a week makes. After the opulence of Newport, we were ready for a dose of reality. 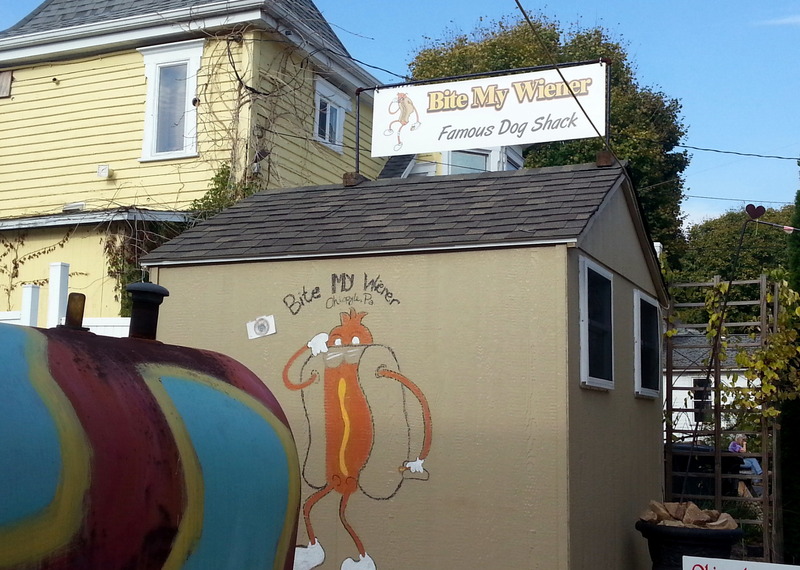 Nope – that wasn’t going to happen in Mystic, CT. But, we thoroughly enjoyed our three days there, weather notwithstanding. 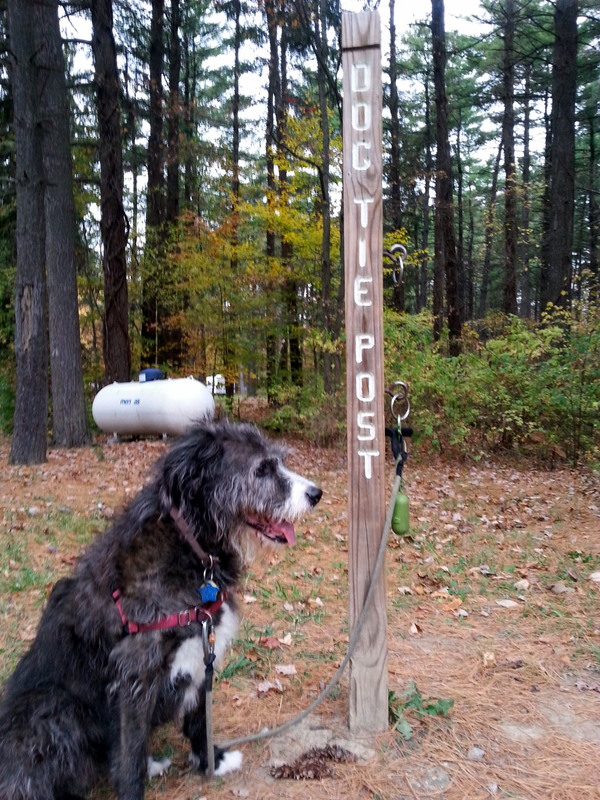 Since Connecticut doesn’t allow dogs in their State Park campgrounds (boo), we elected to stay in Seaport RV Resort. 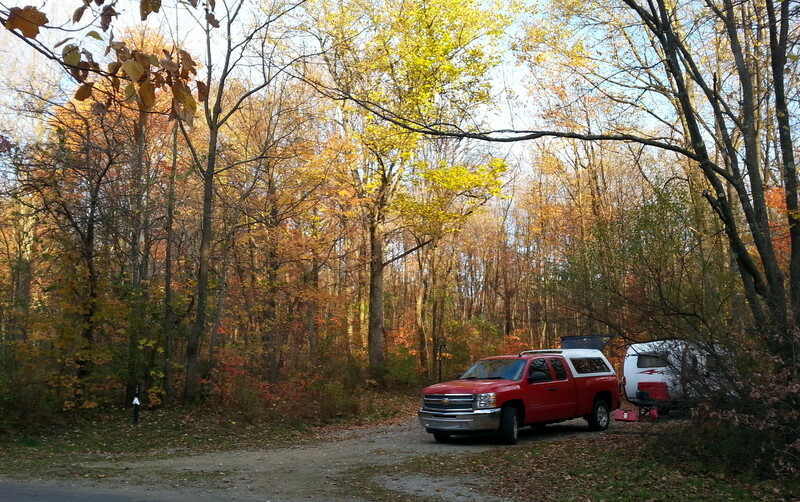 We usually avoid RV parks, but sometimes it’s all about location. Unhappy with the site we were assigned, they offered us the choice of about ten available sites. We selected the only one which was shaded – a reasonable choice on the hot, humid afternoon when we checked in. Oops – a mistake. Very hard rains overnight nearly turned the T@DA into the SS Fireball. We should have been able to predict this calamity. 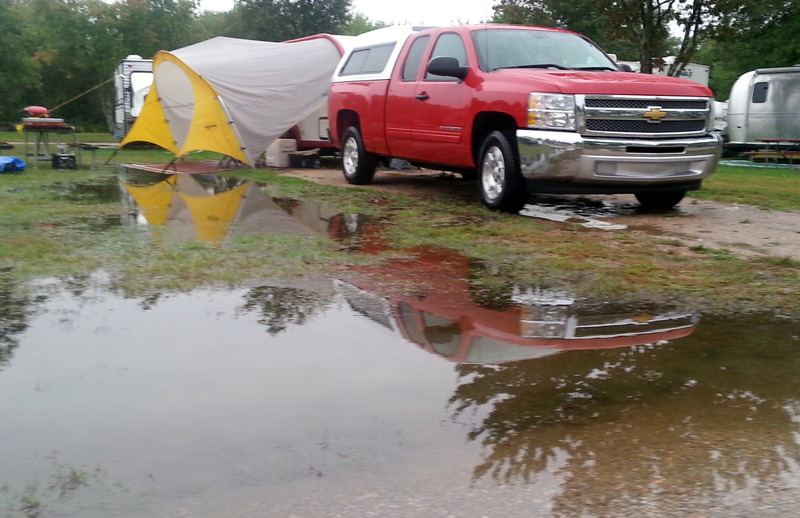 It rained every day we were there, and that damn puddle never receded. 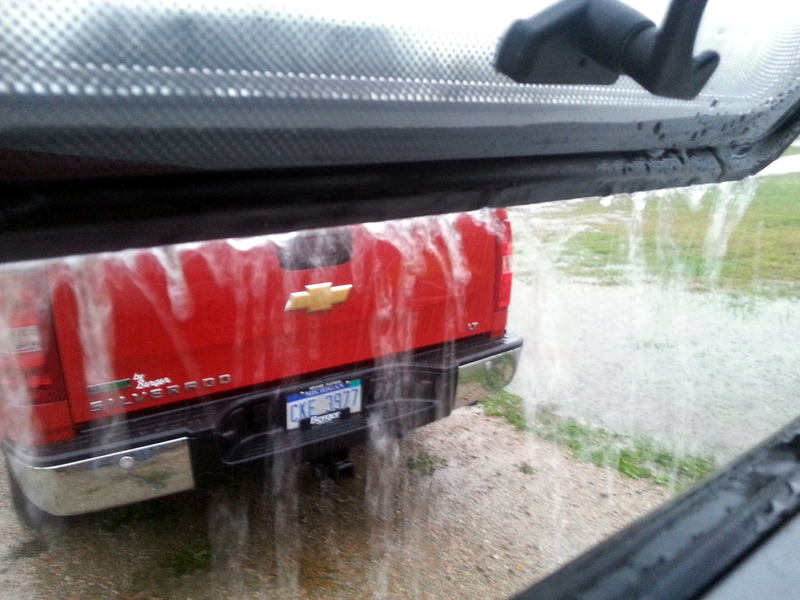 Our patio mat was floating, and we made several unfortunate missteps out of the camper into the lake. 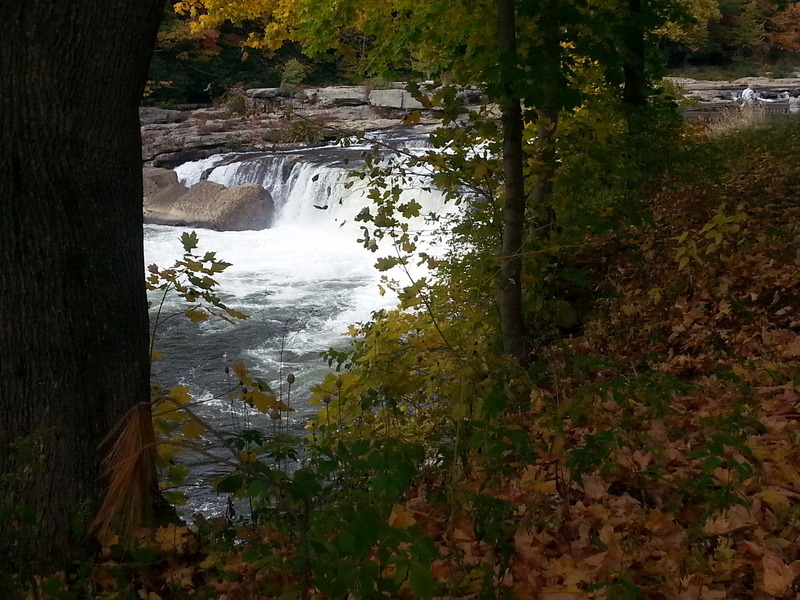 In all fairness, though – the rest of the park was really pretty nice. 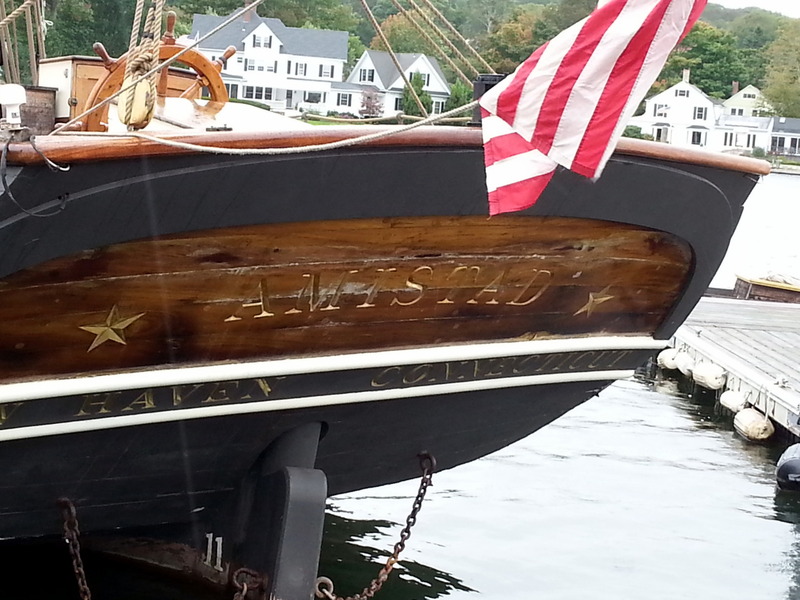 Mystic was a whaling town, until the demise of the industry in the 1920s. 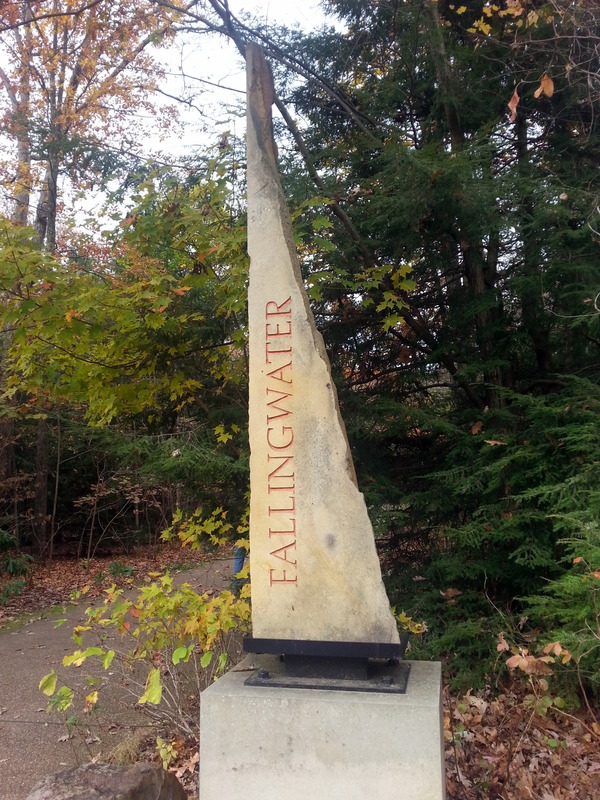 Over the next decade, town leaders decided to recreate the town into a living whaling museum. Not the cute type with costumed actors, but real people doing real work. We loved watching and chatting with the cooper (barrel maker). 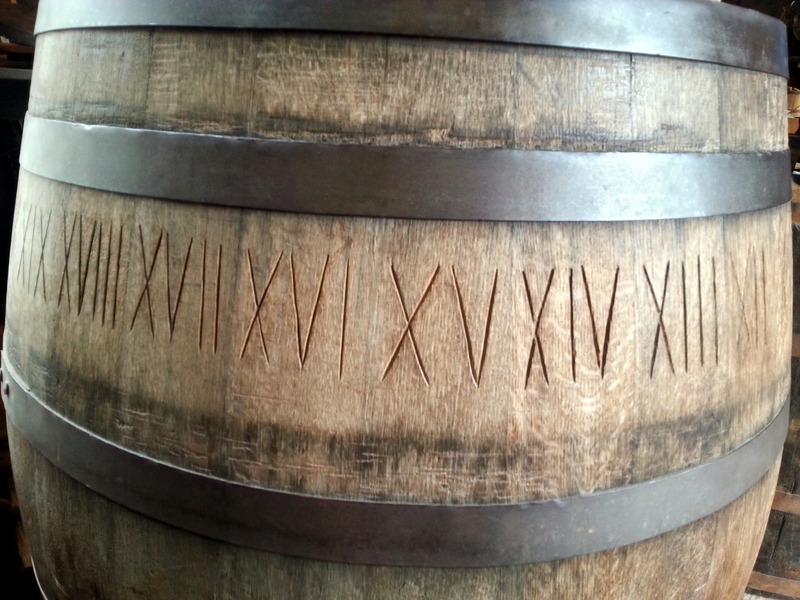 Barrel slats are all consecutively numbered so that the barrels can be taken apart and reconstructed. 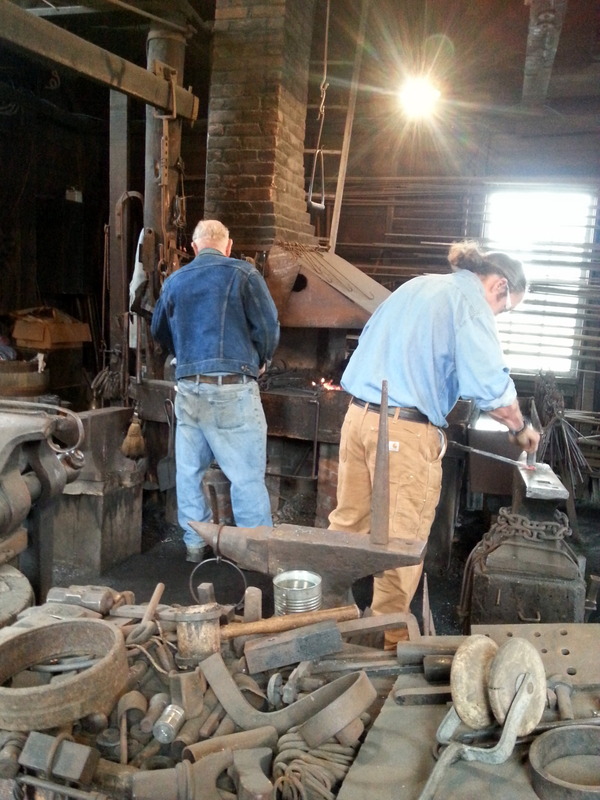 We spent a fair amount of time (over two days) at the blacksmith shop. 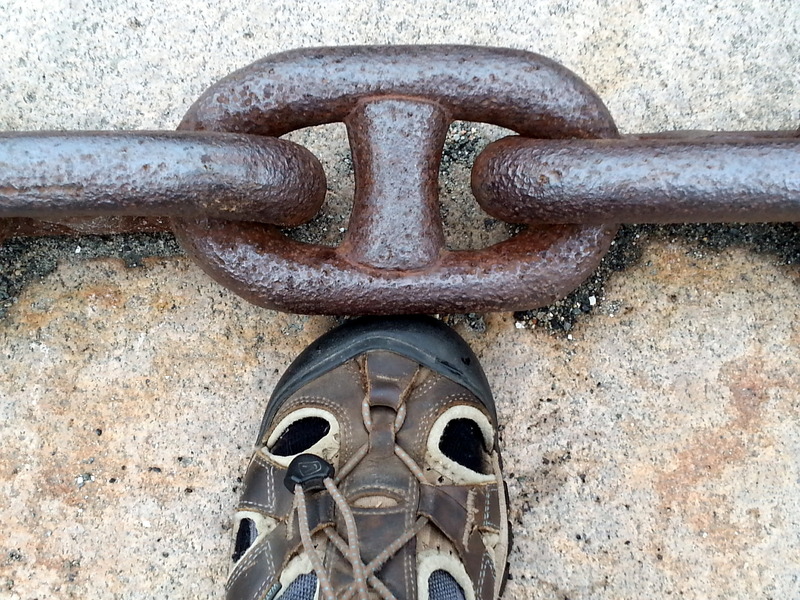 Chains and all manner of forged materials are manufactured here, the hard way. 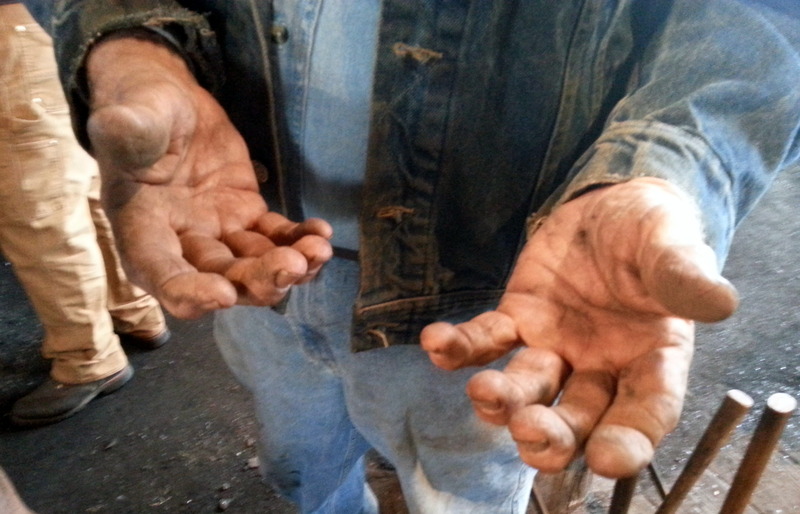 The head blacksmith’s hands were amazing – I asked if I could photograph them, and he obliged, although I was unable to capture his gnarly, stained and stunted fingers. 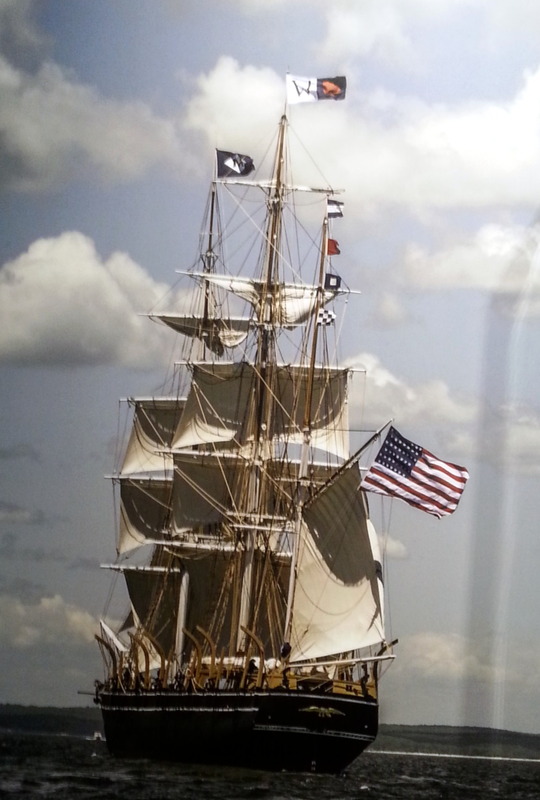 Remember the movie Amistad? 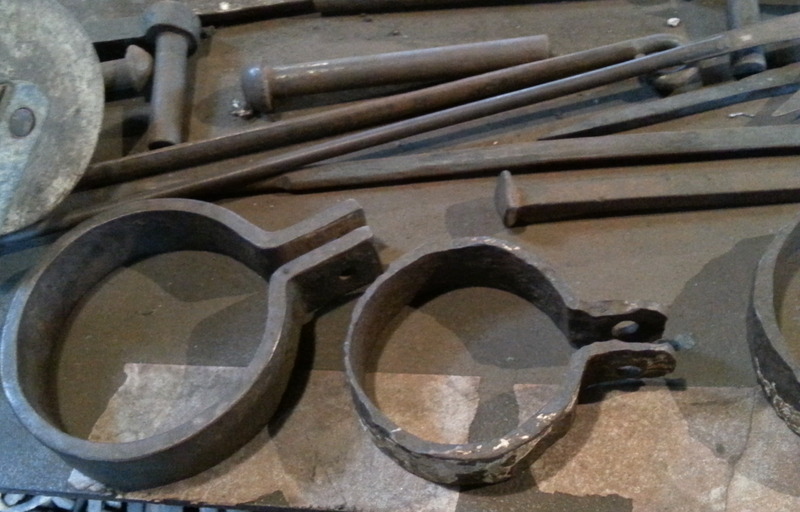 All the leg irons and shackles in the movie were made by this Mystic blacksmith. 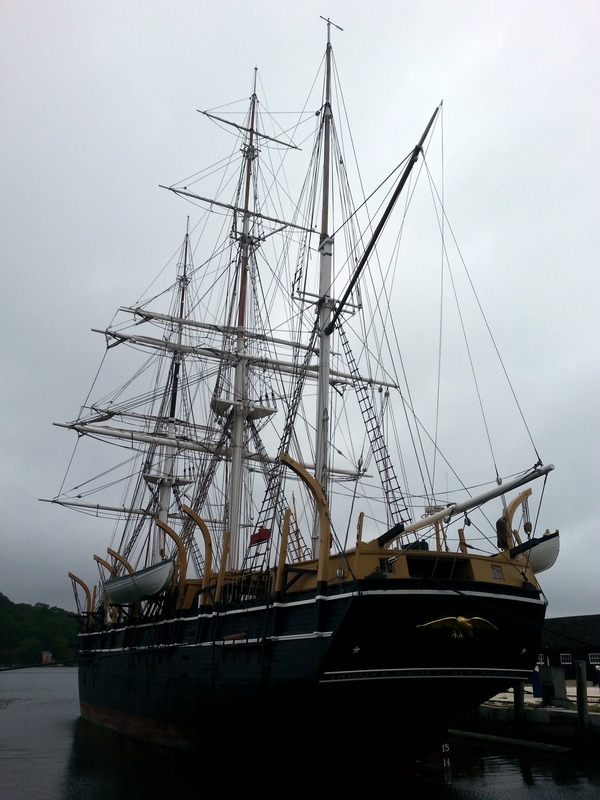 The educational reproduction ship is also docked here, although its future seems uncertain. All in all, I have to admit at being captivated by the living Mystic museum (except for the Planetarium, where the program was laughable). 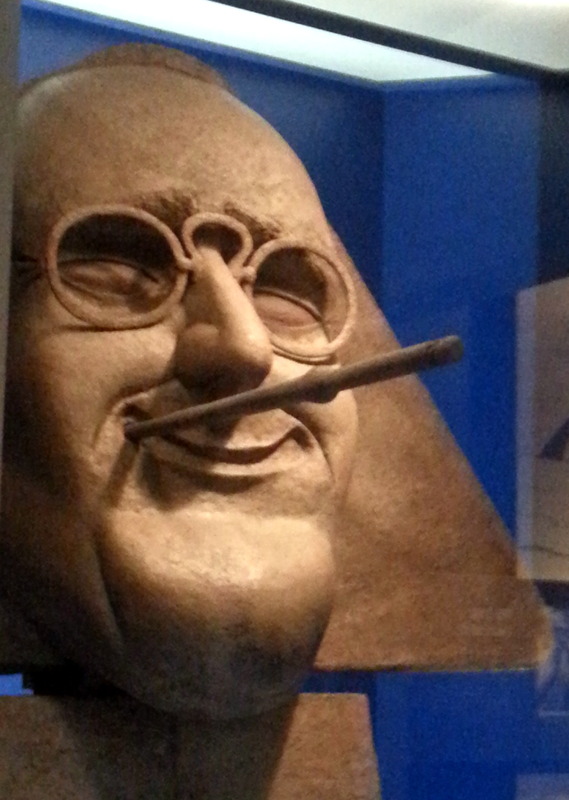 Films, interviews, and working exhibits brought the era alive. 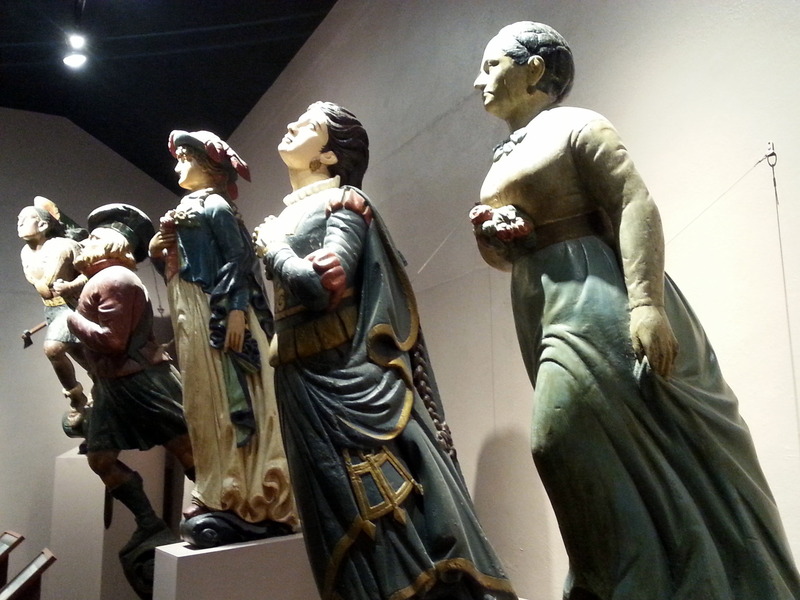 An entire hall is devoted to mastheads from some ships that are long gone. Sadly, the lighting in this room doomed my attempts for any decent photos. 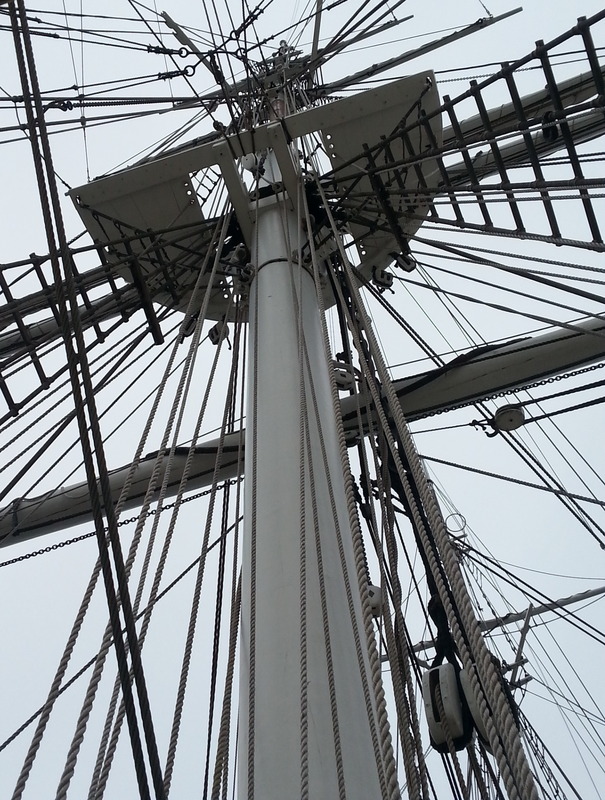 We loved the history lesson, and there was none of the cloying historical reconstruction that can drive me crazy. We took full advantage of the fact that our ticket was good for two days. 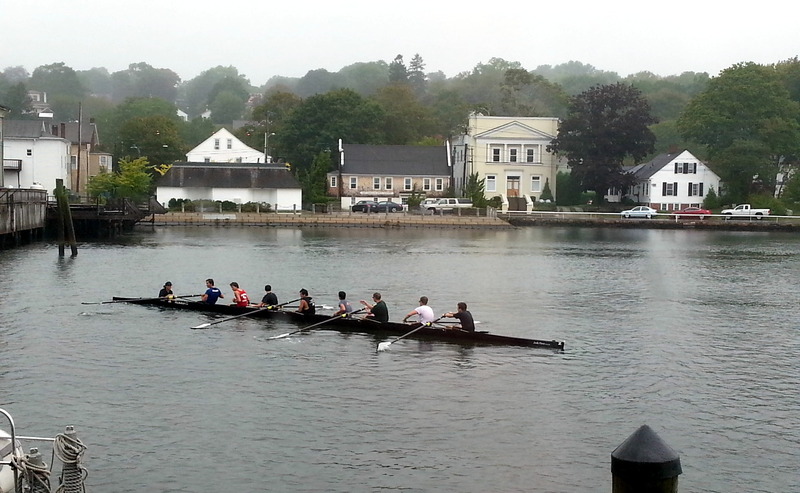 Although we never saw the cantilevered drawbridge in Mystic raise up, we did see a crew team out for practice. So elegant. Can the rain stop yet? Apparently not. 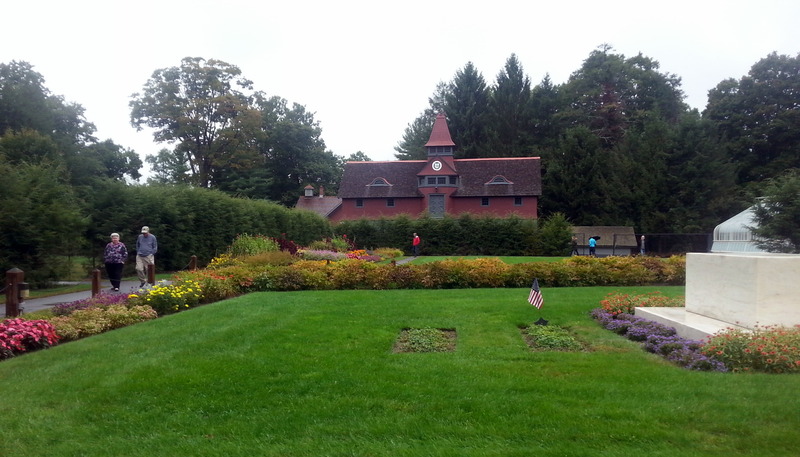 After three days, we headed inland, scuttling our original plan to explore Long Island. 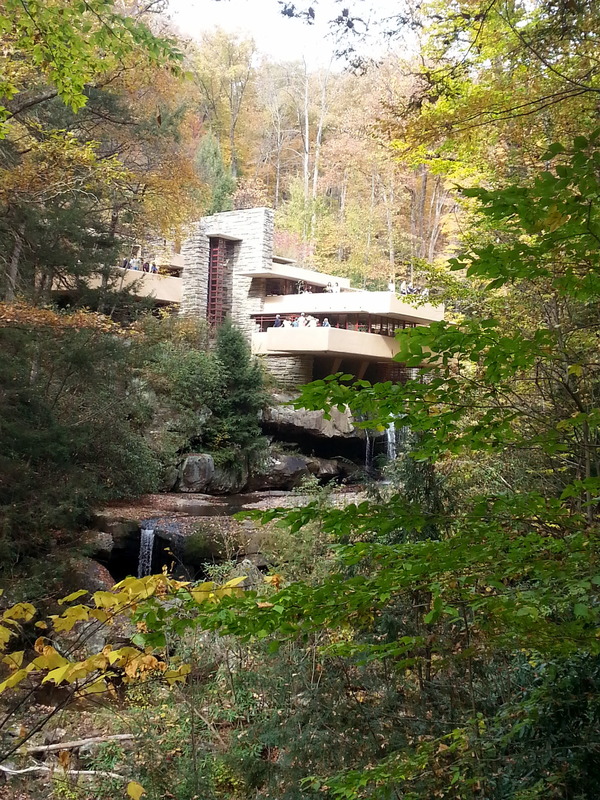 The moisture pushed northward along the coast by Hurricane Joaquin was making us miserable, without any relief in sight. We wanted to make sure we weren’t caught up in an epic disaster, should Joaquin come ashore (he didn’t). 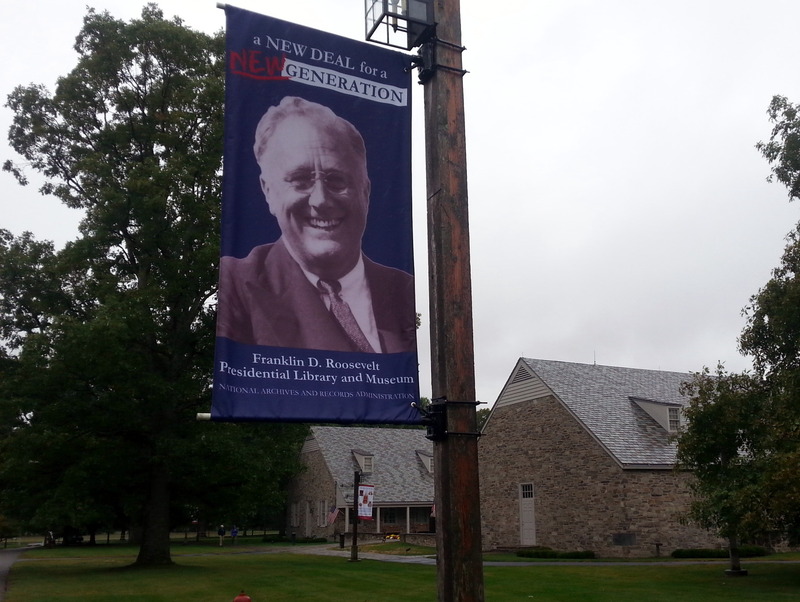 After spending a few hours consulting maps and guidebooks, we decided to head to Hyde Park NY, home of the FDR Presidential Museum and Library. 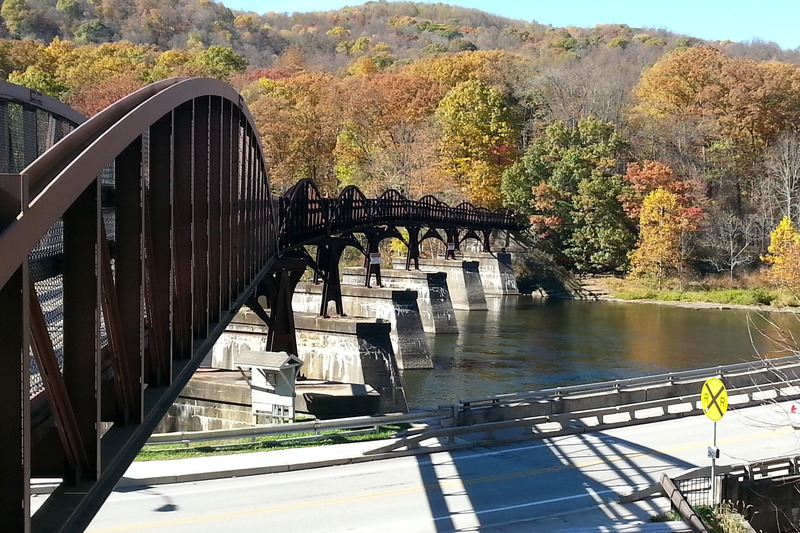 Our headquarters for this exploration would be the Mills-Norrie State Park, just a few miles from the Museum, and only 170 miles from Mystic. But, wait! 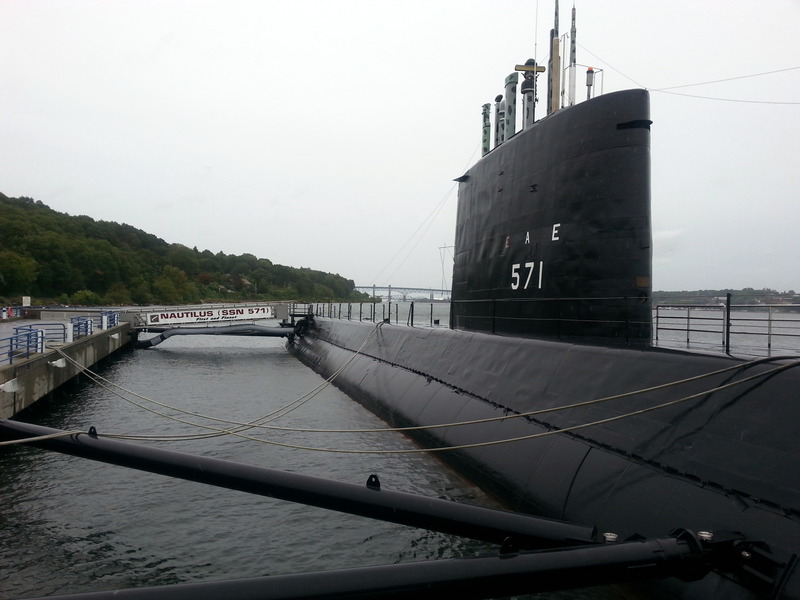 As we pass through New London CT, what’s that sigh about the Nautilus Submarine Museum? After speeding past, we ha to pull off the road and see if this was something we needed to explore. It turned out to be a worthwhile stop. The Nautilus was the first US nuclear submarine. 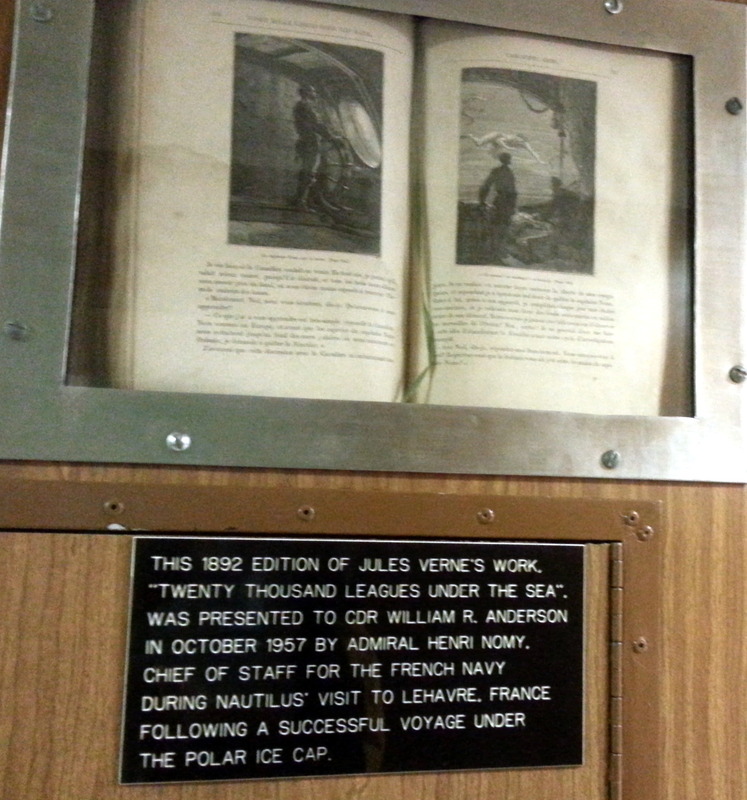 IT was named after the Nautilus in the Jules Verne novel 20 Thousand Leagues Under the Sea of which there is a first (or perhaps just an early) edition copy onboard. 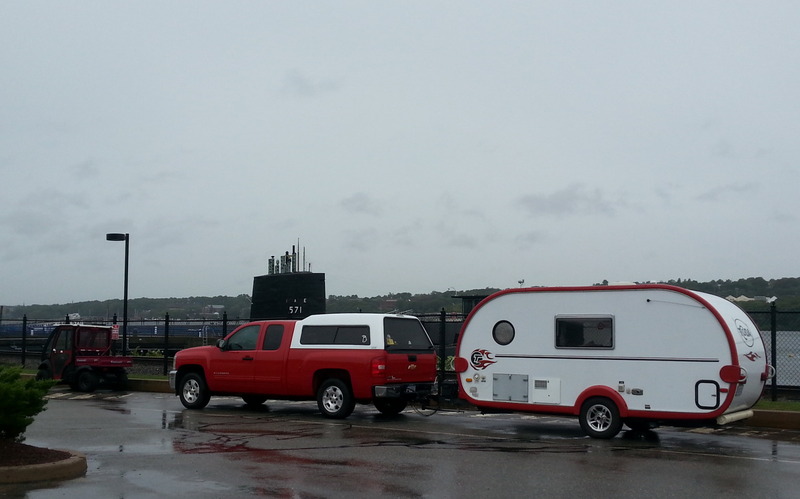 There’s a free museum onsite documenting the history of submarines in the US Navy, complete with a fascinating 50 minute film, which provided a taste of life for the current and past sailors who have served on subs. So many heroes, and such a tough life. It really was inspiring to watch. We toured the Nautilus – and the cramped passageways and tiny personal spaces are truly remarkable. I really cannot imagine being confined to living like this – the training for submariners must be pretty intense to weed out any of the sailors who have the will, but not the ability to live in such confinement. Imagine bunks four beds high in an eight foot room. It was noted that these spaces are larger than all newer subs, except for the very newest, such as the Ohio, the largest sub in the US Navy. 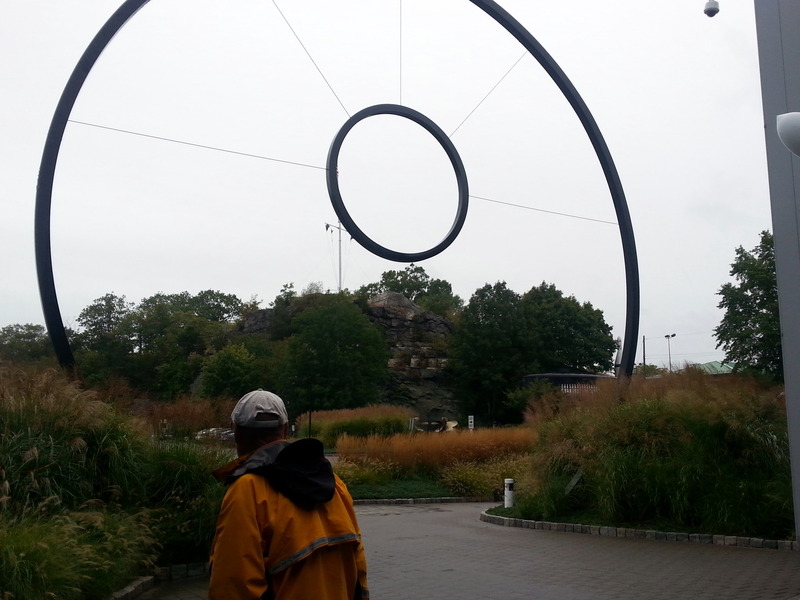 Steel rings outside the museum indicate the diameter of the Holland (the first Navy Sub), compared to the Ohio. 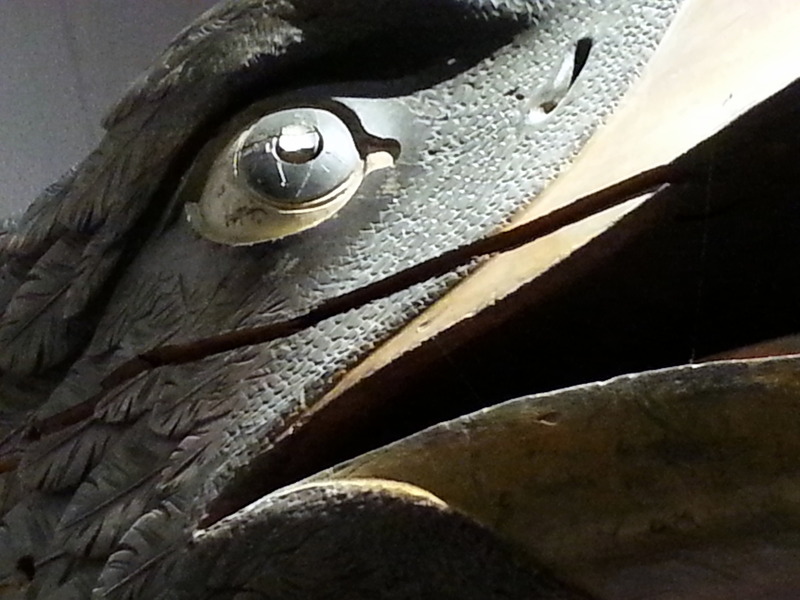 This was an extremely interesting (and free) museum – there’s lots to see here. Onward to Hyde Park, in the rain. The seaside cedar shake cottages of the Massachusetts and Connecticut seashore give way to the clapboard farmhouses and meticulously-manicured farms of the Connecticut byway. 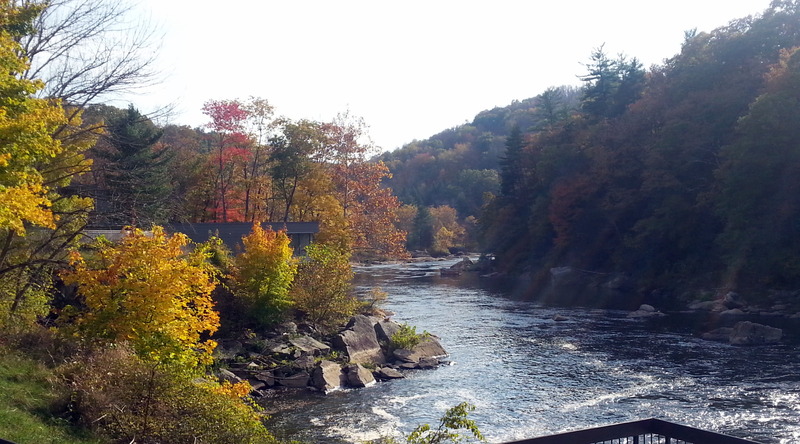 We roll through one picturesque town after another, before finally crossing over into New York. Suddenly, we’re on the massive Hudson River, where the Gilded Age and the clapboard houses bump heads. Such a contrast. 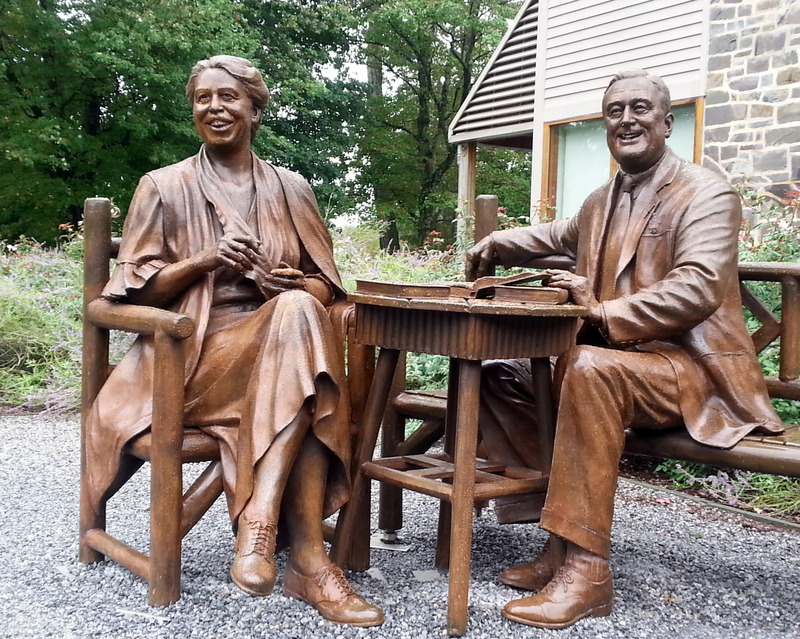 Our first order of business the next day (since it’s STILL raining) is to head for the FDR Presidential Library, on the grounds of the family home of FDR and Eleanor. This was a huge treat. 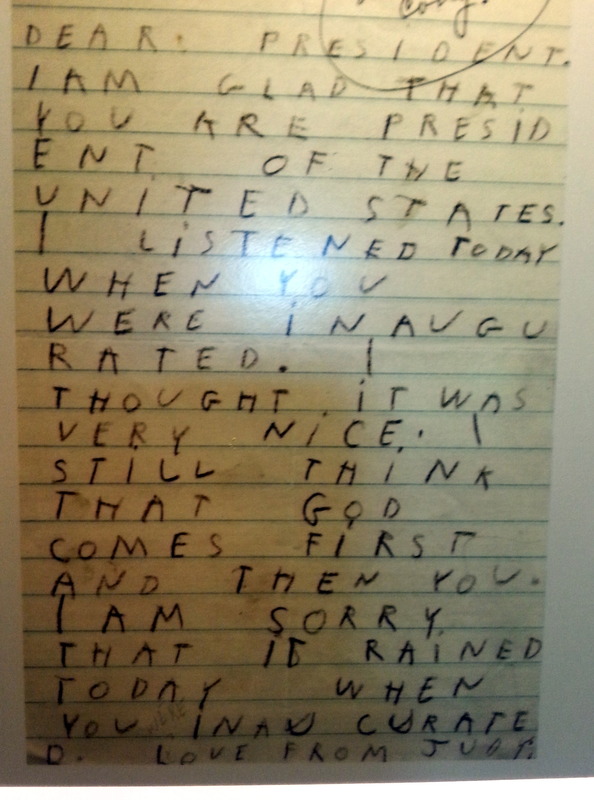 I’ll just share a few of the images – we are becoming huge fans of the Presidential Libraries. Hearing the speeches, seeing the films, and seeing all the documents of the era is wonderful. 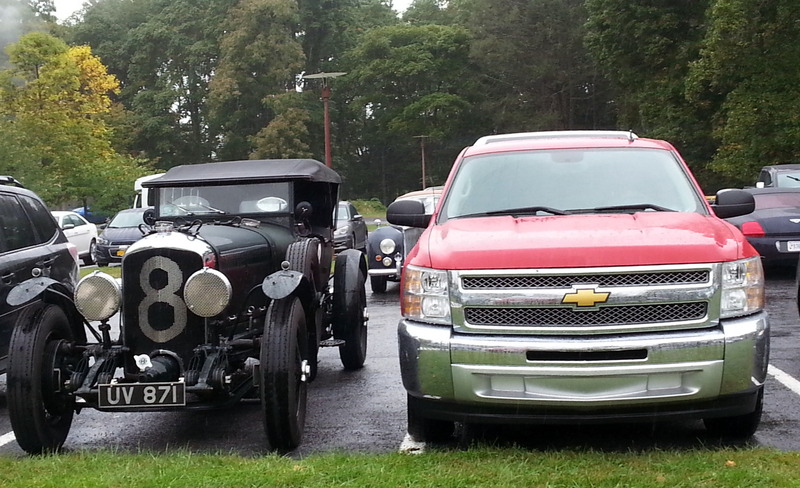 An unexpected bonus was that we rolled in the same morning as the Bentley Club. There were six of these beauties in the parking lot. What a difference the change of a few words made… FDRs battle with the crippling effects of polio are well documented, and there’s no sugarcoating his struggles. There also is no sugarcoating of the split in his and Eleanor’s marriage due to his infidelities with Lucy Mercer. Although they stayed married, separate lives were lived. Eleanor’s achievements are well documented. 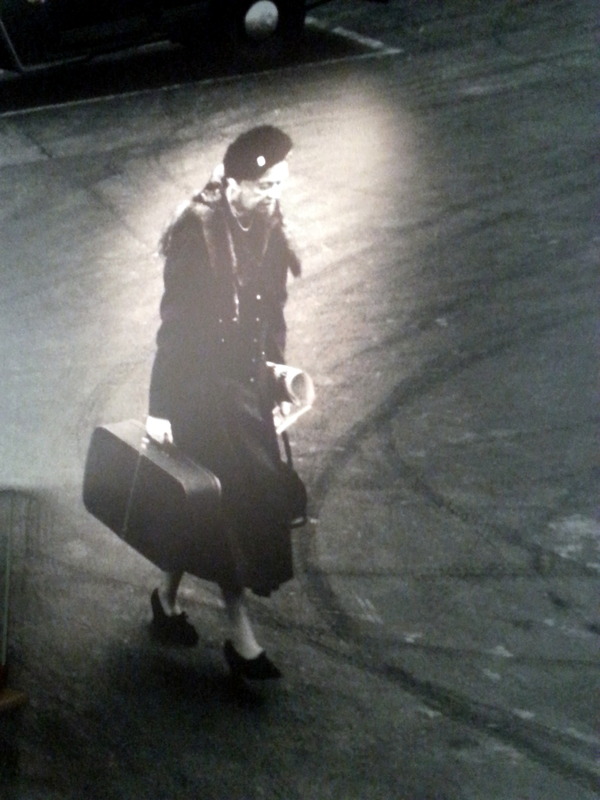 I was touched by this photo of her carrying her own suitcase thru LaGuardia airport in 1960, on her way to confront the KKK in Tennessee. What a woman! Gifts from both citizens and foreign leaders are highlighted. 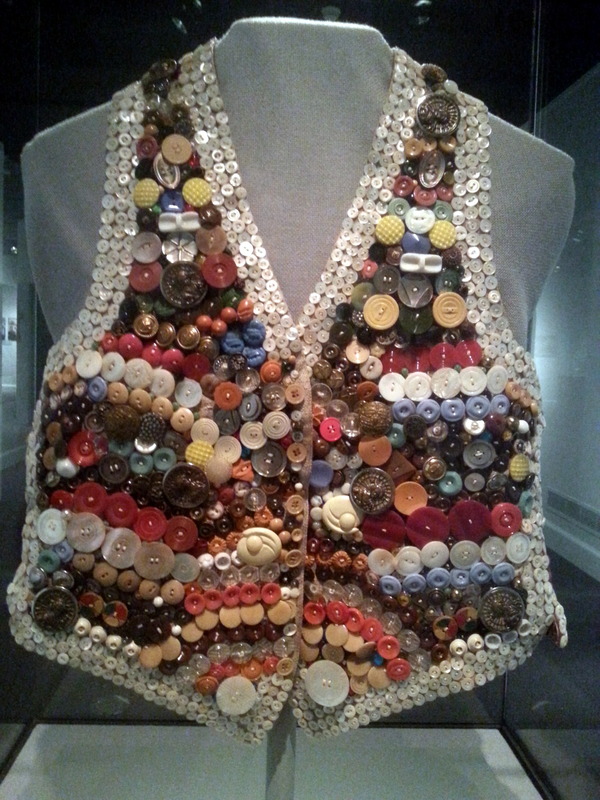 One that really caught my eye was a vest made of buttons collected by a California admirer. 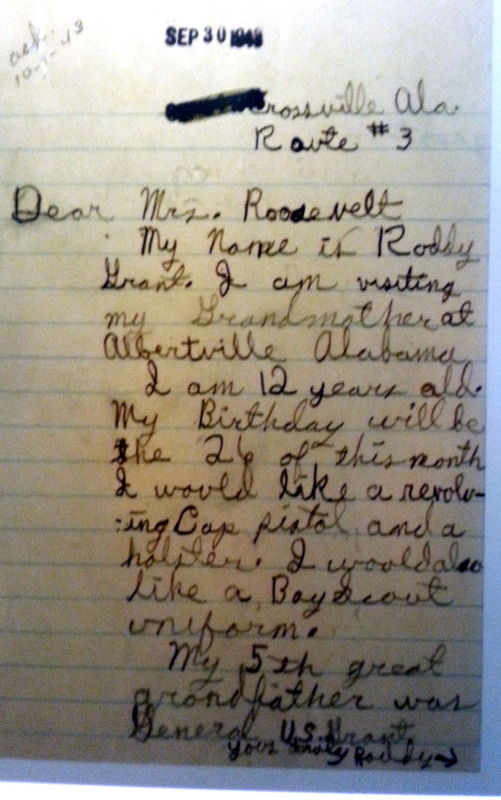 The sender included a letter instructing the President to take a photo of himself wearing the vest, so that she’d have a picture of “her boy” wearing her creation. Made me laugh. Roy Rogers sent custom spurs. 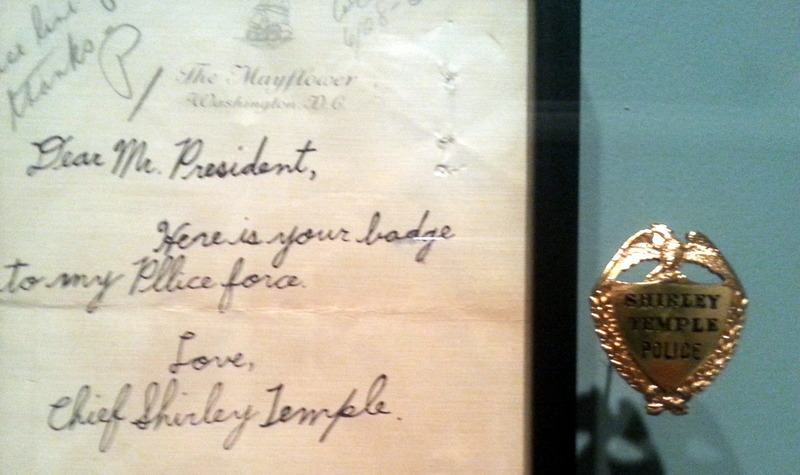 Shirley Temple, a childhood star, made the President an honorary member of her Police Force. 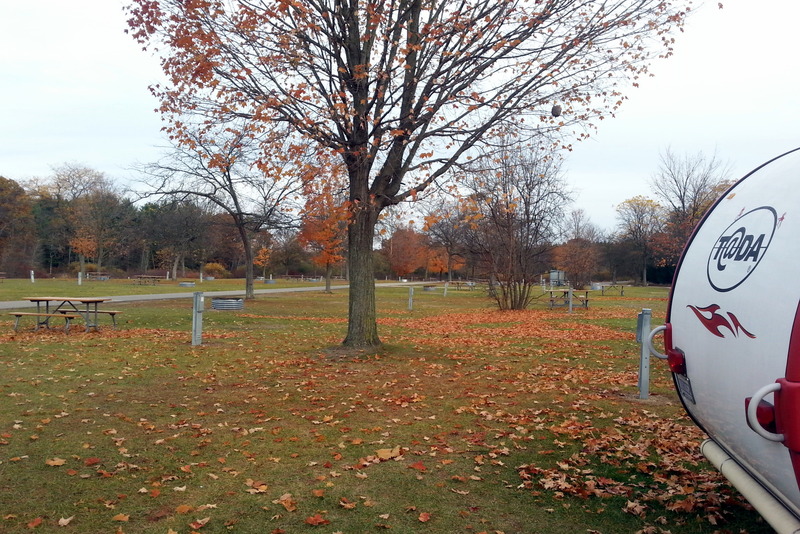 FDR and Eleanor are both buried on the grounds. 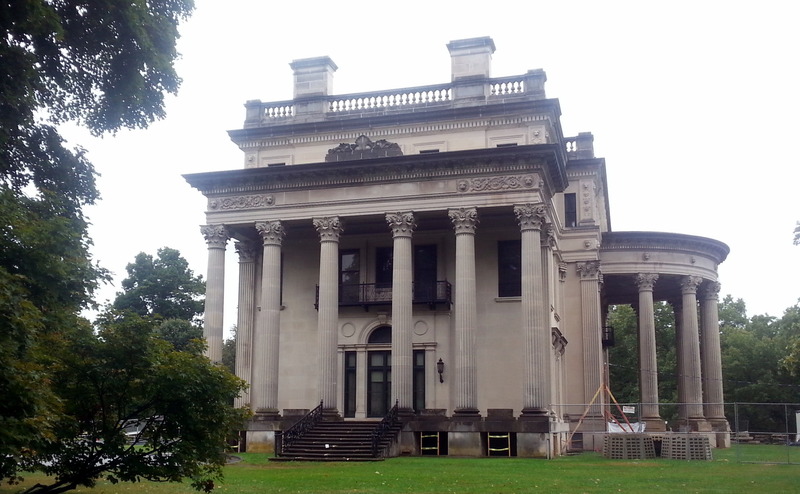 Practically next door to FDRs house was a mansion owned by Frederick Vanderbilt, grandson of Commodore Cornelius Vanderbilt. 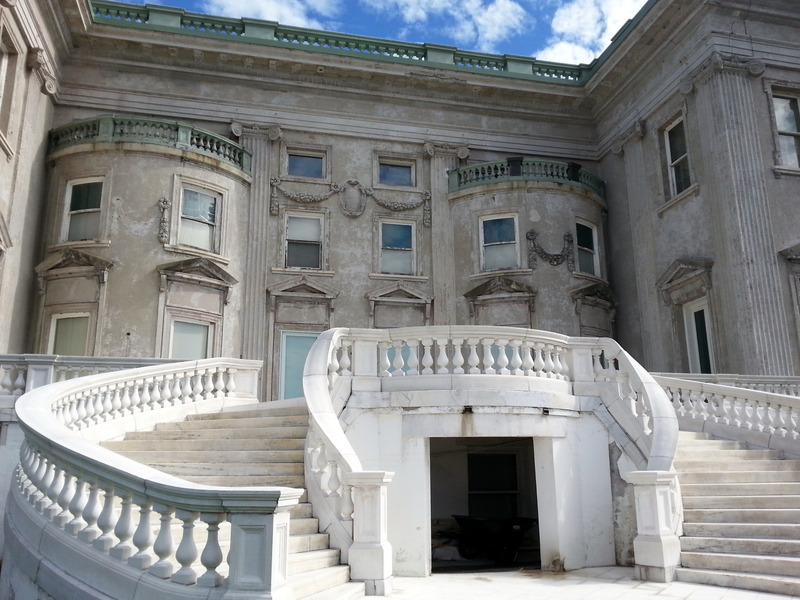 The east coast seems to be littered with Vanderbilt mansions – this large, wealthy family was into showy displays of wealth. 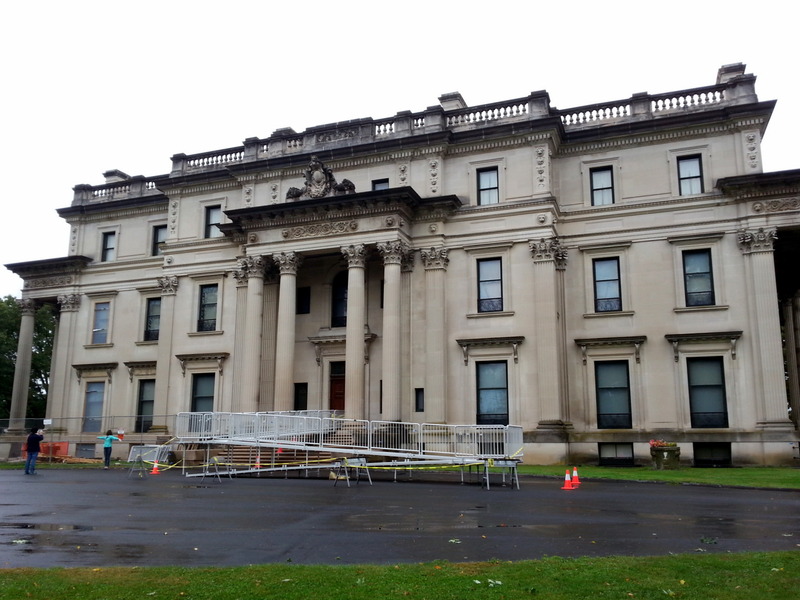 And they aren’t the only ones – the State Park in which we are camped also has a huge mansion of its own. We just don’t see wealth on this scale in Michigan which has been deeded over to the State or National government. Out here, it’s everywhere. 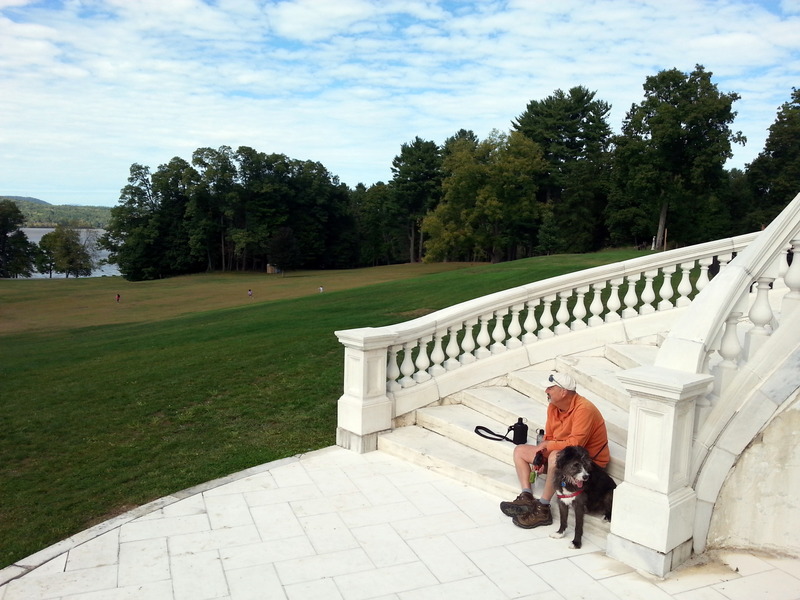 John and Jezzy owned the steps of the the Staatsburgh State Historic Site, the mansion owned by Ogden Mills, overlooking the Hudson River. The diversity of this trip has been amazing. Today was our first day of sunshine, (after six solid days of rain), and we were delighted to throw on our boots, hitch up Jezzy, and hit the trail along the Hudson for six miles or so, even though it did end up at another mansion. Tomorrow, we’re going to cross the Hudson into the Catskill Mountains, camp in the dirt and just hike for a few days.Pit toilets, rustic camp – back to our camping roots. Thanks for hanging in there with me on this – part of my reason for doing this blog is simply to document (for us) where we’ve been, and what we’ve seen. Five years from now, when we’re drooling on ourselves in a nursing home somewhere, perhaps we’ll look at these old posts and remember some great trips. I hope so. It’s a long, strange journey some days….